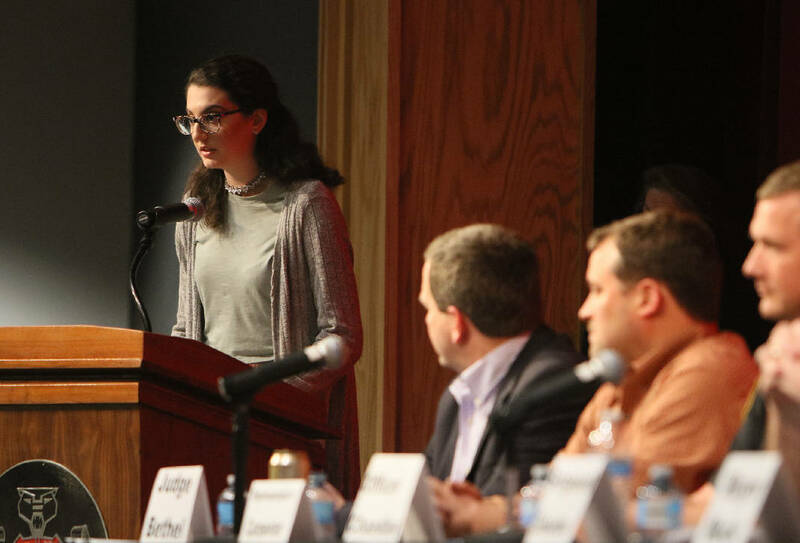 Jessica Jaconetti, a senior at Dalton High School, opens up a gun safety forum that she organized with other students at Dalton High School Monday, March 26, 2018 in Dalton, Ga. 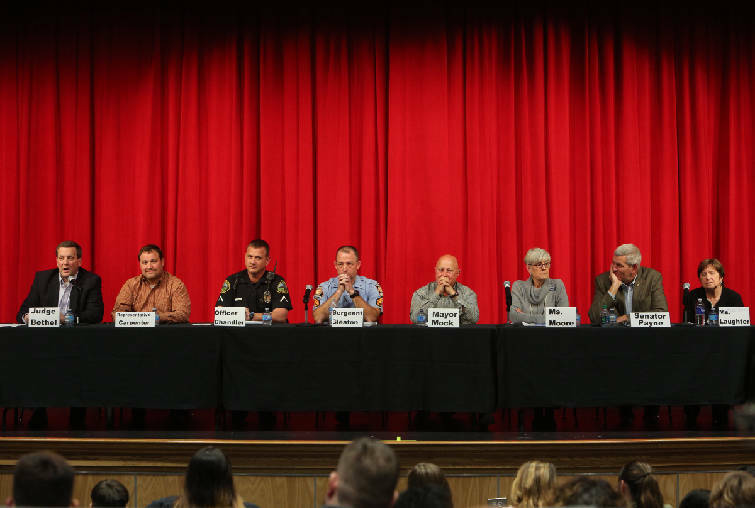 The forum gave students the opportunity to ask a variety of questions to state and community leaders, including topics on mental health, proactive measures and guns themselves. This story was updated March 26, 2018, at 10:47 p.m.
DALTON, Ga. — After the Parkland, Fla., shooting, Dalton High School students Alyssa Anderson and Jessica Jaconetti wanted to do something to organize change. Anderson said she didn't know Jaconetti before she reached out to administrators to talk about organizing a student walkout on March 14 to honor the victims in Florida's Feb. 14 shooting. Jaconetti had also reached out with the same goal. At the time, she said, "It was about being worried something would happen in our school. Then it did." Just two weeks earlier, Dalton High School experienced its own shooting when social studies teacher Jesse Randal Davidson locked himself in his classroom and fired a .38 through a window on Feb. 28, according to Dalton police. He had sneaked the gun onto campus in his computer case. No one was injured in that shooting, but students still feared the worst while the events transpired. With that incident still fresh, administrators told Anderson a walkout wouldn't do much for any actual change, so they connected her with Jaconetti, who had also reached out, and they worked together with administrators to organize a public forum on school safety, which was held Monday night. Judge Charlie Bethel, Rep. Kasey Carpenter, Officer Bart Chandler, Sgt. First Class D.C. Gleaton, Dalton Mayor Dennis Mock, Bonnie Moore, Sen. Chuck Payne and Chairwoman Lynn Laughter serve as panelists during a public forum on gun safety at Dalton High School Monday, March 26, 2018 in Dalton, Ga. The forum gave students the opportunity to ask a variety of questions to state and community leaders, including topics on mental health, proactive measures and guns themselves. Most notable in attendance at Monday night's forum were Georgia Sen. Chuck Payne, state Rep. Kasey Carpenter, Dalton Mayor Dennis Mock and Judge Charlie Bethel. The high school's student resource officer and a Georgia State Patrol sergeant also were present. Students' questions ranged from panelists' thoughts on school safety measures and gun law reform to how to address mental health issues, though some panelists were unable to answer opinionated questions due to their professions. Carpenter and Payne noted several bills and resolutions that are making their way through the Georgia House that address school safety. For example, the STOP School Violence Act would improve security measures and add specialized training for school officials in responding to mental health crises. Most panelists did not support legislation limiting the ability to obtain weapons, though the one who could respond with an opinion did acknowledge more can be done to have more thorough background checks that include mental health checks. "There are a lot of things the state can do," Payne said. "I think, really, as the saying goes, 'You can't legislate morality.' I don't know that greater and tougher gun laws are the solution." But Lynn Laughter, chairwoman of the Board of Commissioners, said that while she was a strong Second Amendment supporter, she was opposed to people being able to easily purchase assault rifles. "I don't see any reason people should be able to be able to buy AK-47s that fire multiple rounds," she said, the audience clapping. "Why does anybody need that if they're not in war?"